Well after doing 3 days at dungy then comming home to drop bits n bobs of as well as to pic up my other rods i was off to chesil in search of a cod,but none showed up for me at chesil or dungy. Friday i noticed the wind was dropping so a look on xcweather as well as the met office and it was spot on,the swell would be dropping down and so would the wind,the only draw back was high water was at 535pm . arrived there before high water found a spot on the packed beach and set up 1 rod with a live bait rig on the other rig with 6/0 hooks baited with black lug and freash cuttle fish. Casting was someone funny as everytime i was about to cast i would get a side wind hitting the lead,so id have to start again distance with the cuttle bait was prob 80 yards max (small cuttles) The other rod was baited withjsut black lug and cast as far as i could manage. reeled in the cuttle rod and bait was gone,so re baited and out she went,got to the other rod that had black lug on and started to reel in and thought,FFS another poxy doggie,but this didnt fight like a doggie infact it was just a dead weight on the end,got it to the surfline and had to pick my moment to beach what ever this was. got the fish onto the beach and went down to have a look and what do i see ? Once i had knocked it on its head i gutted it only to find that is was full and i mean full of roe!! nice report lee unlucky on the coddies, bit thin on the ground this end but we had 4 on the boat yesterday. 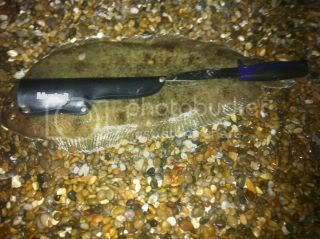 thats a monster sole, hope you got better pics to send of to the mags. 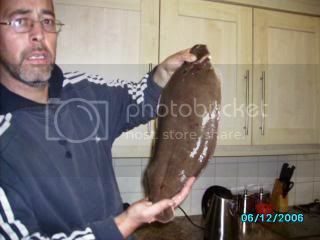 i also thought you caught a monster sole at the bristol channel? 3lb odd. I aint putting it in any mags mate. yea i did catch a sole from the Bristol channel last year that went 3lb 2oz no(not gutted) and been left in the sink for 5 hrs lol. But I'd rather have a 20 lb cod than a sole. Anyone know what the record is ?? I gotta be close to it ain't I ? Id love a 20lb cod from the shore!!! Come to think of it I'd love a 20lb cod full stop!! Funks I needs to join a club, not for the match fishing but just to be in a club for reasons like this.